Scrum is a worldwide known agile framework for completing complex projects. Scrum was originally meant for software development teams, but works well for any complex, innovative scope of work, regardless of the business industry. Like other agile development methodologies, Scrum can be implemented through a wide range of tools. One of the most popular is a Scrum task board. What is a Scrum task board? A Scrum task board is an integral part of the Scrum method. It consists of rows and columns - each row is a user story, which functions as a unit of work that the Scrum team uses for their product backlog. Tasks are recorded on colored cards. Team members update the task board frequently, most commonly during the daily meetings, based on the team’s progress since the last update. If someone comes up with a new task, it is written on a new card and placed on the board. During the daily Scrum meeting, changes are made and the cards are moved around the Scrum board. Each task card starts on the Scrum task board in the “To Do” column. The basic columns used on a task board are: “To Do”, “Work In Process”, “To Verify”, “Done”. A Scrum board gives a quick, easy view of the items within the sprint, that the development team is currently working on and has already completed. 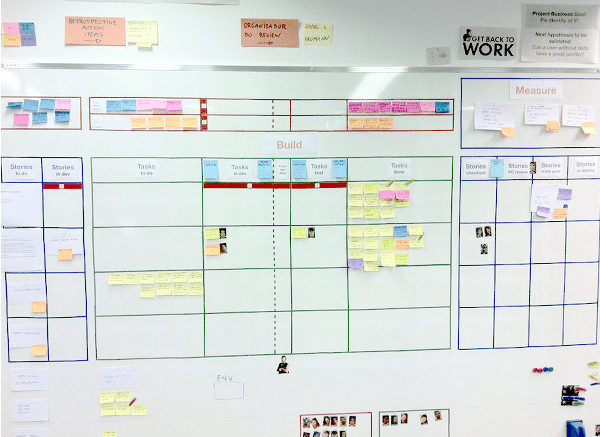 Scrum board can be drawn on a whiteboard, cork or metal board or even on a section of a wall. However, traditional Scrum board can get very messy, very fast. Different colored post-it notes might not stick to the board that well and flutter down like autumn leaves. This is one of the reasons why a growing number of teams use a virtual version of a task board. Furthermore, a web-based board can be easily synchronized with other software systems, also it allows teams to collaborate in real-time, anywhere. Below, we compare the main arguments for online and for offline task boards. Distributed teams can finally work together: a Scrum board is visible for everyone, anytime and from anywhere. A virtual card has higher information capacity (you can add attachments, links, to-do-lists, etc.). Historical data is always available. It is easier to analyze the workflow (using a Breakdown Chart, a Lead and Cycle Time Diagram) and to prepare reports (you can save important data into an excel spreadsheet). It has far more customization options to mach the unique nature of your business. It forces people to be in the same room and communicate face-to-face. It is easier to keep the discipline to create consistent cards, with the necessary relevant data. It is usually easier to change your process workflow (simply draw an extra column with a marker). It creates a focal point for stand-ups. Kanban Tool is a web-based task board, that helps teams to spectacularly increase their productivity in line with Scrum methodology. Do not miss the opportunity to jump ahead of your competition. Start a free trial now.